(Nanowerk Spotlight) Most of today's rocket engines rely on chemical propulsion. All current spacecraft use some form of chemical rocket for launch and most use them for attitude control as well (the control of the angular position and rotation of the spacecraft, either relative to the object that it is orbiting, or relative to the celestial sphere). Real rocket scientists though are actively researching new forms of space propulsion systems. One heavily researched area is electric propulsion (EP) that includes field emission electric propulsion (FEEP), colloid thrusters and other versions of field emission thrusters (FETs). EP systems significantly reduce the required propellant mass compared to conventional chemical rockets, allowing to increase the payload capacity or decrease the launch mass. EP has been successfully demonstrated as primary propulsion systems for NASA’s Deep Space 1, Japan’s HAYABUSA, and ESA’s SMART-1 missions. A new EP concept proposes to utilize electrostatically charged and accelerated nanoparticles as propellant. Millions of micron-sized nanoparticle thrusters would fit on one square centimeter, allowing the fabrication of highly scaleable thruster arrays. Field emission thrusters are not suitable for launching a spacecraft into orbit. Their intended purpose is to provide attitude control and acceleration. Orbiting spacecraft are subjected to a variety of forces while circling an object in space: drag, gravity, solar pressure and magnetic streams all must be compensated for in order to maintain the desired orbit. The very low and highly controllable thrust levels provided by various electric propulsion technologies enable a new category of missions which otherwise would not be possible. A new electrostatic thruster technology is under development at the University of Michigan's Plasmadynamics and Electric Propulsion Laboratory, using nanoparticles as propellant with micro- and nano-electromechanical systems (MEMS/NEMS). Termed the nanoparticle field extraction thruster – nanoFET – this highly integrated propulsion concept is a high efficiency, variable specific impulse engine type that can be readily scalable for a large range of future space science and exploration missions. 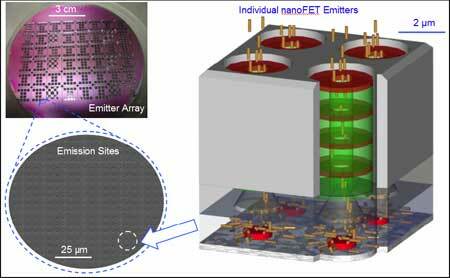 The nanoFET utilizes highly scalable MEMS/NEMS structures to feed, extract and accelerate nanoparticles through micron-sized thrusters. The nanoparticles to be used as propellant can be of various geometries and materials. Here is how it works: Conductive nanoparticles would be transported to a small liquid-filled reservoir by a micro-fluidic flow transport system. Particles that come into contact with the bottom conducting plate would become charged and pulled to the liquid surface by the imposed electric field. If the electrostatic force near the surface can cause charged nanoparticles to break through the surface tension, field focusing would quickly accelerate the particles through the surface. Once extracted, the charged nanoparticles would be accelerated by the vacuum electric field and ejected, thus generating thrust. One intriguing aspect of nanoFET is that it uses MEMS/NEMS technology to enable a "flat-panel" thruster design that incorporates power processing as well as nanoparticle manufacture, storage, feed, extraction, and acceleration. This results in a modular and geometrically scaleable propulsion system, from watts to megawatts, allowing the decoupling of thruster design from spacecraft design. Another advantage of this system is that it affords a much broader set of missions with a single engine type – nanoFETs have an unprecedented thrust-to-power ratio for electric propulsion systems; they can adjust specific impulse over a large range from 100s to 10,000s; they show a high efficiency range of over 90% over the entire specific impulse range; they do not have the life-limiting factors common in ion thrusters. The system is also very flexible with regard to the size and type of particles that can be used. Almost any conductive nanoparticle, such as carbon nanotubes, fullerenes, as well as metal nanospheres and nanowires could be used. Currently, the researchers are experimenting with silver, nickel and copper nanoparticles ranging in size from 5 nm to 70 nm. So far, the experimental results have validated the theoretical models and represent a significant step towards proving the fundamental feasibility of nanoFET.